When I make brown rice in my rice cooker I do up a big batch. The leftovers are divided into freezer containers for future use. 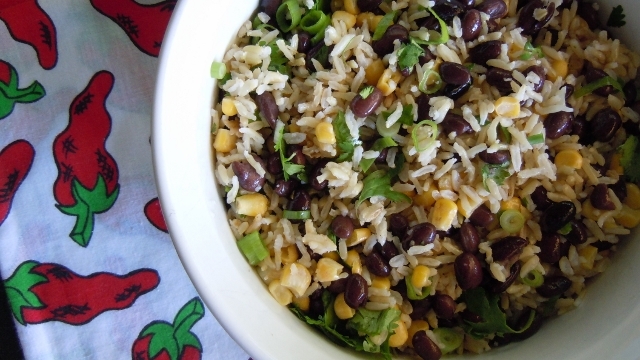 One easy but very flavorful dish I use precooked rice for is what I call Fiesta Rice. Of course it’s also great with hot rice right out of the pot. You can take the basic recipe and modify it to your personal taste. I make it different all the time and usually don’t follow a recipe its more of a dump and stir method, but no matter what it always tastes delicious! The last time it was made I actually used measuring cups and wrote it all down so I could give you a real recipe. I’m always thinking of you! If you don’t like corn – leave it out – if you love corn why not double it – don’t have black beans use kidney or pinto. If you like a little heat add some diced jalapeno, don’t have rice no problem- use quinoa. Sometimes I add salsa or chopped tomatoes – just depends on what it’s being served with. Remember usually I just toss ingredients in the bowl, stir and when it looks good I serve it. If you stick with the lime juice, cilantro, brown rice and a touch of salt it’s pretty much like the rice at Chipotle. This is good eats and it can’t get any easier. Combine all the ingredients in a medium size bowl and stir until well combined. Serve hot or at room temperature. This can be a side dish with enchiladas, burritos or tacos or served as a main dish. You can eat it wrapped up in warm corn tortillas topped off with salsa. Serve it over a bed of shredded romaine with home made corn tortilla chips and add some chopped avocado. Remember when I told you about my recipe for Quinoa Mango Salad being selected to be on the Carrie on Vegan, iPhone & iPad App called Vegan Delish? Well Carrie graciously offered to host a give-a-way for three of my readers to receive the Vegan Delish app for free!!! Be sure to check out the Vegan Delish Facebook page too. The Vegan Delish iPhone & iPad App has multiple features! You don’t have to be following a plant based diet in order to enjoy the recipes. They are healthy delicious foods that will fit into most food plans. If you have been thinking about introducing some meatless meals into your food plan this app will help. All recipes include a photo which I really like – you can create a list of your favorite recipes and you can make a shopping list from the ingredients in a recipe and print it! It’s easy to use – even I figured it out, but there is a How To Use This App feature that walks you through it step by step if need be. If you are standing in the grocery store trying to think of what to make for dinner just open this App and find a recipe to try. It’s that easy! This is how it looks on the iPad. Don’t you want this Chocolate Cherry Bomb? Me too! You must live in the USA and have access to an iPhone or iPad to use the app. Three winners will be chosen using random.org. The give-a- way will remain open until midnight Monday night August 26, 2013. I’m extending it so everyone has a chance to enter! Winners will be announced next week in a post and I will also email you so be sure to use the correct email address. I am not being compensated for this post and as usual all opinions are my own. Thanks to Carrie who is sponsoring the give-a-way for 3 lucky people! All you have to do to enter the give-a-way is leave me a comment telling me what is one of your favorite quick and easy healthy meals to eat at home. Yep – it’s that easy! Thanks for reading my blog – be sure to leave a comment and have a chance to get the free app! I like to take frozen spinach, canned diced tomato, cooked turkey sausage or canned white beans and red pepper flakes and sauté it. I wanted to tell you I made your Chipotle Chicken Taco Salad last night for the first night. Both my husband and I loved it!!! We also make your Pork Medallions with Balsamic Reduction regularly — most recently while on vacation — its so quick and easy! Thank you for leaving the “old recipes” up! That salad is one of the most popular recipes on my blog! I need to revamp it and make a vegan version. So glad to know you enjoyed it and the pork medallions as well. No worries – I don’t plan on removing the old recipes as many people like yourself count on them! Tweeted for you!!!!! You rock Tami!!! My favorite quick and easy meal is a pita with hummus and veggies. I’ve been thinking about it all day. I’m a huge fan of Carrie’s iPhone App, plus honored to have one of my recipes featured on her blog. The Fiesta rice sounds pretty good! I often take a little Greek yogurt, mix it with whatever fresh herbs I have on hand to make a dip, and serve it with cooked chicken and veggies. Yum! That sounds so easy and yet delicious Rachel! Of my favorite quick and easy meal is soft tacos – with or without meat. I love corn tortillas! Often times I will pre-cook ground turkey and freeze in 1 lb. containers. With some tortillas, meat, diced tomato, onion, cilantro and avocado dinner can be on the table in 15 minutes. Growing up we had pinto beans and tortillas often. These days I tend to black beans instead of pintos but there are days when corn tortilla and a bowl of pinto beans with diced onions and bell peppers is just what I must have. I will put pinto beans in the crockpot and let them simmer all day. Come home fill a bowl, add diced veges, heat up tortillas and I’m set. Linda I also love corn tortillas! In fact I had lentil tacos with corn tortillas for dinner tonight. I love your 15 minute meal idea. Cooking ahead makes such a difference. I like that you are using your crockpot too. I love getting it already in the morning and having dinner ready and waiting that night. Thank you for sharing your childhood memories of pinto beans and tortillas – it’s a little bit of comfort in a bowl! I have seen this app before and think it looks amazing. I don’t do a lot of vegan dishes because I can’t eat garlic, onion, and BEANS (makes it difficult, right?!) but I know this app would be nice to have for clients/inspiration. Favorite quick and healthy meal? Egg whites with spinach and mushrooms and a tiny bit of cheese and salsa. My favorite dish right now is zucchini boats stuffed with beans, quinoa, mushrooms and onions…with a side of local corn! Tara your stuffed zucchini boats sound delish! Hi! Your app looks great! My quick and easy go-to meal lately has been a morning smoothie using frozen blueberries and strawberries, with some spinach, vanilla almond milk, and some orange juice mixed in. I love that for breakfast, with some peanut butter on wheat toast. Shelly your smoothie sounds wonderful – I haven’t made one in a while so I will put it on the menu! You can never go wrong with peanut butter on toast. Yum! What a great giveaway! I’ve been interested in checking out Carrie’s app, and it seems to keep getting better and better with more recipes being added every day. One of my favorite easy dinners is to pick a sauce of some kind, then create a bowl of ingredients based on that sauce. Last week, we made a Creamy Basil dressing, then picked up some produce from the farmers market (corn, tomatoes, green beans) and raided our cabinets for things that would pair well with it (orzo and white beans). That was dinner! I love your idea of creating a bowl around a sauce – that is brilliant! Carrie’s app is awesome and she is adding new recipes all the time. I love it! My favorite go to meal is tostados made with vegetarian refried beans taco sauce (heat in oven) top with lettuce, diced green and red pepper , diced onion, garlic, chopped tomato and avocado. ahhh slow cooker? rice cooker?! Yesterday for lunch I made an easy creation from the leftovers in the fridge: precooked rice with pizza sauce, pizza seasoning, sliced olives, and sauteed mushrooms. Yummy and satisfying! That sounds so good Candy! I need to make a pizza vegan style! Yum to that rice dish! Oh darn, I am too late and missed your giveaway, but those recipes look amazing vegan or not! Someone is going to be one lucky winner! Come back next week Renee when I have a cookbook giveaway! Have a great holiday weekend. I actually prefer using cold rice when making dishes like that – it tends to separate better for me. Great giveaway! If it were up to me, I’d have breakfast for dinner once a week – a veggie frittata with roasted potatoes. Somehow I think my husband would miss the meat! I don’t have an iPad or iPhone so I don’t need to enter the giveaway, but I just wanted to say this rice sounds great! It takes so long to make brown rice (and I don’t have a rice cooker either) so I really should make a huge batch and freeze it – so convenient!